The question you have now is: how do you choose a heating installation, repair and maintenance company that is competent and professional? The following are 6 tips for choosing the right heating contractor in Summit, Illinois. When trying to choose a heating service, it’s important that you get a feel for your prospective company’s reputation. In most cases, a company with a good reputation will do good work. After all, past customers are probably not going to say nice things about a company that did a poor job for them. To get a feel for a company’s reputation, you should take a look at some review sites. Google, Facebook, Yelp, and other such sites will usually have reviews on the company you’re thinking about using. Do you want to be held accountable for incidental damage that might occur on your property by a heating contractor? If not, it’s wise to make sure that the company you hire has insurance. At a minimum, heating companies should have two types of insurance: workers’ compensation insurance and general liability insurance. These insurances will cover damages to both property and employees. In the State of Illinois, it is not necessary for HVAC companies to obtain state HVAC licenses. However, in the village of Summit, Illinois, it is required that all contractors have a contractor’s license. These businesses will also need to be officially registered with the village. You should not hire a company that is not certified. Choosing an unlicensed and uncertified company will leave you susceptible to potential negligence and incompetence. 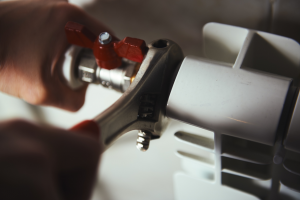 While an inexperienced HVAC technician might be capable of installing, repairing, and maintaining heating systems, you probably don’t want to be the one to test his or her abilities. Instead, it’s wise to hire an HVAC technician with plenty of experience on his or her side. In general, you should look to hire a company that’s been in business for 4 or more years. A company that has made it this long will have demonstrated competency on a consistent basis. If you’re having a new furnace or boiler installed, or if you’re having repairs done on your existing furnace or boiler, it’s best to ensure that you’re getting guaranteed work. You don’t want to have to pay for a service that wasn’t done correctly. While most parts come with manufacturer’s warranties, a part is only as good as the person who’s installing it. You’ll want to make sure that the company you work with provides guarantees on labor, so you won’t have to pay twice for things installed incorrectly. One last thing you should do when choosing a heating company is to ask for an estimate of the work to be done. This is the best way to ensure that you have the funds necessary to pay your bill. If you don’t ask for an estimate, you could end up with a surprisingly large bill somewhere down the line. Looking for a Heating Contractor in Summit, Illinois? If you’re reading this blog, you’re likely in need of a heating contractor in Summit, Illinois. If so, you’ve found a good one. AE Power Plumbing, Heating, and Cooling is Summit’s premier heating company. Our team of skilled HVAC specialists is well-versed in the installation, maintenance, and repair of all types of heating systems. Whether you’re dealing with a furnace, a boiler, or a gas log fireplace, we can help you.